If you’ve always wanted to create your own unique Kentucky Derby hat--one that will make a huge splash wherever you go and which you can save forever as an amazing keepsake, Dee’s is your headquarters. With over 48 years of ever evolving experience in hats, Dee’s has a helpful, professional staff and all the materials you need to make a fabulously unique topper. Let Dee’s expert staff help you choose a base hat from a huge variety of styles and a rainbow of colors; they will then assist you in choosing feathers, netting, ribbon, flowers, and much more, to suit your taste and style. 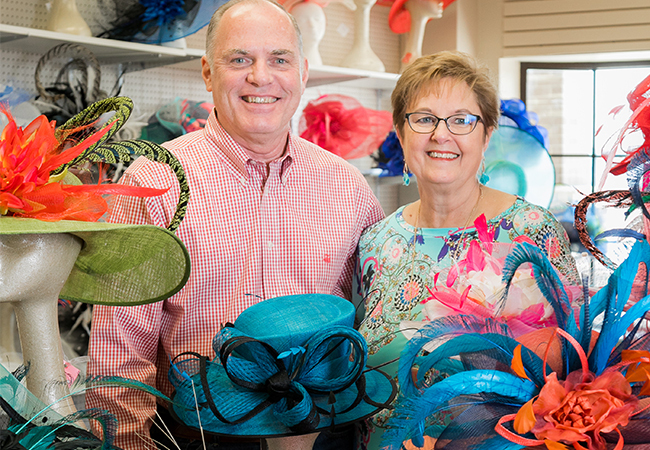 Dee’s will lend their expertise in assembling a Derby hat so completely self-expressive and totally “you”—or they can completely relieve your stress and create the masterpiece for you! Dee’s also has hundreds of unique hats and fascinators on display which you can take home immediately. If you already have a dress or outfit in mind, bring it in; Dees is bursting with every accoutrement to perfect your Derby ensemble, including stunning jewelry and accessories. Dee’s is a Louisville institution, attributing their long tenure to attentive, personal service to each customer, a fabulous selection, and a drive and dedication to constantly embracing modern style. Their motto is “If you haven’t seen Dee’s lately, you haven’t seen Dees!”…and it is most certainly true. Every time you walk through the door, you’ll find a virtually whole new store!